German planes bombed the city center of Rotterdam. Bombs landed in the center of the city and parts of Kralingen. A death toll is still unknown, but the fear is that there will be more than a thousand. The city has turned into a hell on earth. Houses have been razed to the ground and a large part of the city is on fire. In many places it takes effort to breathe, by the many fires. The smoke can be seen far out of town. The fire comes out of hands to fight all fires. A large part of the area firefighters sent to Rotterdam. It is expected that it will take days to fight all fires, because in some places even the gas taps are turned to be. There is also a shortage of firewater. Employees of the Red Cross to try to get people from under the rubble, but are hampered because roads are impassable through the bombardment. Employees of the City of Rotterdam are working to make the roads passable again. The mess is indescribable, but some newspapers have yet attempted. It is especially Delftsche Courant getting a clear picture. Among the important buildings on the Coolsingel are severely damaged or destroyed. The Rotterdam Bank, the Coolsingel Hospital, the Amsterdam bank and many restaurants are destroyed. The Tivoli Theater is on fire. The new city hall is still standing and looks undamaged. the exhibition, which last week completed, also had some critical hits, but seems fairly intact. According to police, it is in the rest of the center of Rotterdam otherwise. The buildings on the Kruiskade, the Goudsche Singel, Oostzeedijk and Schiedamsedijk all razed to the ground. Most people walk aimlessly down the street, if they were in shock. However, there are some people who can describe how "hell of Rotterdam 'looks. (excerpt from: Rotterdam after the bombardment 14 mei 1940. Maker: J. of Duyvenbode. Rotterdam Municipal). A picture of the deaths and injuries can not be given yet. In hospitals in the city is buzzing, with an un-Dutch way of working. When Bergweg Hospital the injured are located in the corridors, because the halls are full. The victims who did not make it, be placed in the garden. The injuries are often large, of the internal injury as far as broken bones. Many people have to wait for help and there seems to be a shortage of all medical resources. There is in the hospital have opened a second operating theater, by a surgeon who has come about from the destroyed Coolsingel Hospital. The patients of the hospital have been transferred to the church in the Van Oldenbarneveltstraat. 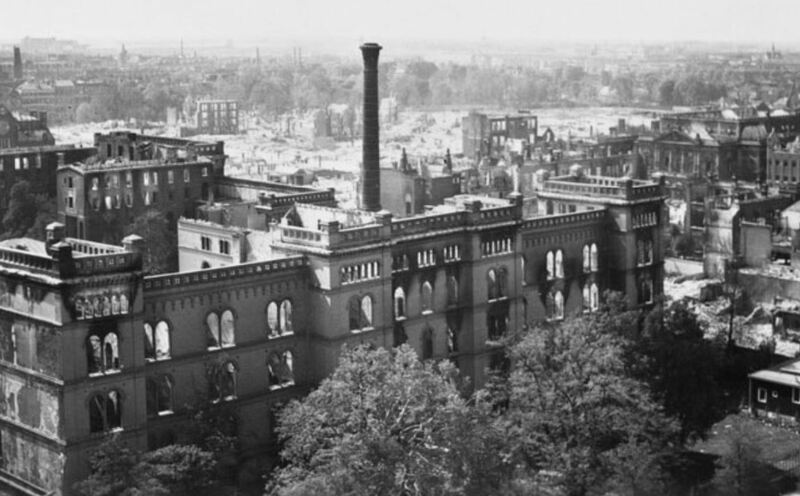 Noordsingel is also the prison hit by bombs. One of the wings of the prison lies in ruins. As another wing threatens to collapse the prisoners are released. Not everyone leaves immediately, Some of them help to get people from the rubble. NSB and German soldiers, which have been captured in recent days, may not yet gone. Prison staff are afraid they will be lynched, as they put one foot outside the gate. They receive guidance towards 'safe area'. Rotterdam Zoo also affected by the bombing appears on the Coolsingel. There are monkeys, see zebras and bison. There are also going wild rumors that the tame lion Tammo would roam, but that is not seen. The Blijdorp was two days ago also been affected by a series of bombs. To prevent wild animals would walk through the city decided the army leadership to complete the dangerous animals. Only Tammo could stay alive. How is it going with him is unclear. The zoo is working with a move towards the Blijdorp polder. The zoo was therefore closed. Meanwhile, there is a flow of people begun by people who want to leave the city. People take everything they could so easily collect them and pull towards The Hague and Gouda. At the same time there is also a group of people on the way to Rotterdam, the family living in the city. In and around Rotterdam is fighting for days between Germans and Dutch soldiers. Thus, the Germans have established a beachhead in South Rotterdam. Marines try to keep in control of the north side of the city. From Dordrecht tank divisions en route to Rotterdam, but there is heavy fighting. Eyewitnesses have seen that there is communication between the German commander Schmidt and Dutch colonel Scharroo, responsible for the defense of the city. As discussed therein, is niet bekend. After the bombing have surrendered the Dutch forces in Rotterdam. The consequences of the bombing of Rotterdam is gigantic. Zo’n 24.000 houses are bombed or go up in flames, by the fires that arose. The death toll did not meet the "thousands’ which was previously feared, but 650 tot 900 is particularly high. Additionally touched 80.000 homeless. 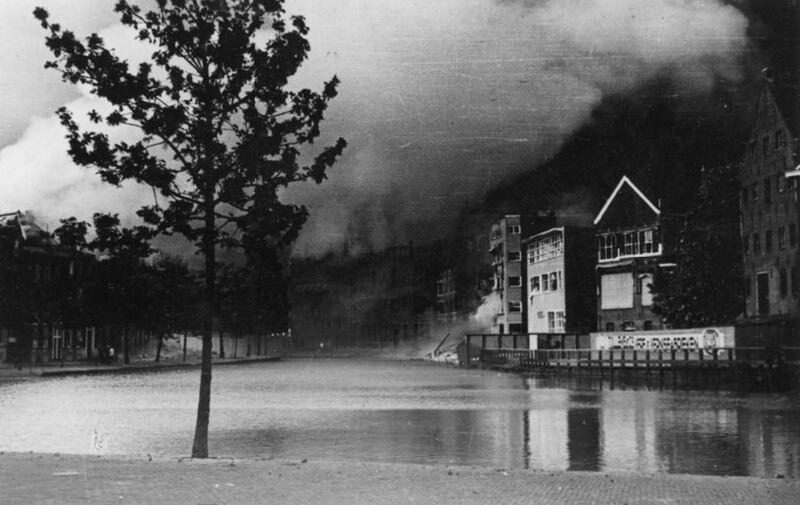 The bombing of Rotterdam had not broken the Dutch resistance, but it was close. Moreover, the way to The Hague was now open. So when the Germans Utrecht threatened to throw flat the next day, This was reason enough for the capitulation. Op 15 mei 1940 was signed the surrender in a school in Rijsoord. It took a few days before all the fires were subdued. What remained was a large smoking ruins. But soon began the clean-up and a few days after the bombardment the city architect Witteveen had been commissioned to make new plans. That plan was 1941 largely rejected, to the anger of Witteveen.